Zack Snyder Keeps 'MAN OF STEEL'S' Tornado Scene, Despite Oklahoma Tragedy. That's at the heart of a key scene in "Man of Steel," which has been glimpsed in the trailers. But with the recent tornado devastation in Oklahoma -- where two EF5 twisters left dozens dead -- would the scene remain in the movie? 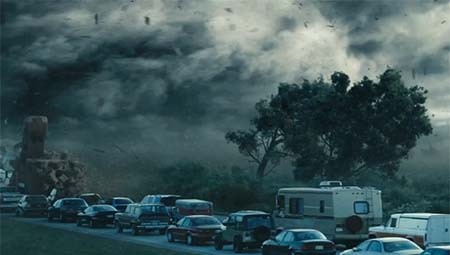 Director Zack Snyder confirmed that he is keeping the tornado sequence. "He's changed by those events. If anything, we feel like our Superman has a connection -- not to make light of it -- to the kind of grief that happens during those kinds of natural disasters," Snyder said. "Also, in a sad way, even Superman can't change that." If Snyder had altered or removed the scene, it wouldn't have been the first time that a movie did so out of sensitivity to recent tragedies. "Gangster Squad" cut a movie theater shooting scene out of deference to last summer's tragedy in Aurora, Colorado. The "Man of Steel" team sends their hopes and thoughts to everyone affected by the Oklahoma tornadoes. "It's a terrible tragedy, mother nature doing its thing," said star Henry Cavill. "I hope that everyone who can salvage things can salvage things, grieve if they need to grieve, move on from stuff and repair and rebuild, if they have the opportunity. I can't even imagine what it's like."